Now coming to our topic, If you ever lose your WordPress password, follow below methods to reset WordPress password. Step 5: Once you click on the “Get New Password” button, an email will be sent to your mail id to reset WordPress password. Step 6: Open the email and click on the new link mentioned in the mail, you will be redirected to a new page where you can reset the WordPress password. Step 7: Enter the new password. It will also show a strength indicator bar which will help you to know the strength of your new password. 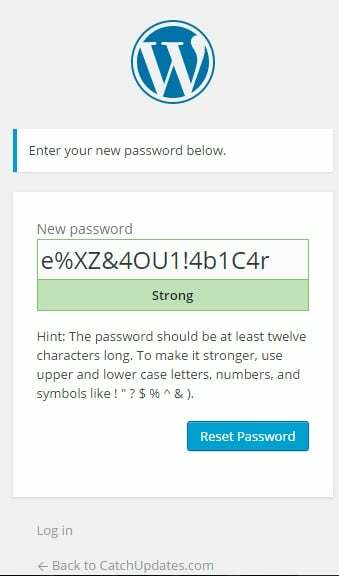 Use a strong password that is not easy to be hacked or guessed. 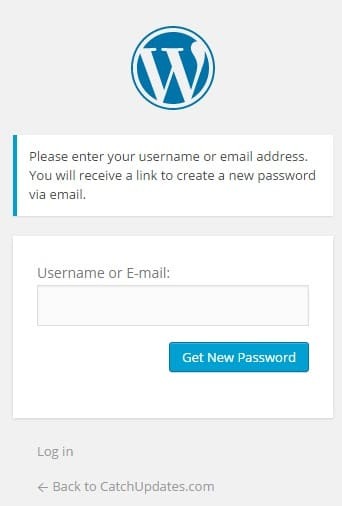 Step 8: Open the WordPress Login page again and enter the username along with the new password in the WordPress login area. You should be able to login to your dashboard now. Step 9: You have successfully reset WordPress password. Step 2: Scroll down to ‘Database’ panel. Step 4: You will be redirected to the phpMyAdmin page for your website. Step 5: Select the database you are using. If you do not know the name of the database which relates to the site you are unable to gain access to, you will first need to identify it. If you know the name of the database, you can skip this step. Otherwise, you will need to access the root directory of your website — either via your hosting provider’s File Manager (located on the cPanel), or via an FTP client. Either way, will work fine. The file you are looking for within your site’s root directory is “wp-config.php” — go ahead and open it up. Step 6: Click on the ‘wp_users’ table. It will show you all the users with usernames and passwords. Step 7: Click on the ‘Edit’ button for the username you want to change the password. Step 8: It will open the table in an editable format. Step 9: Look for ‘user_pass’ to update the password as shown below. 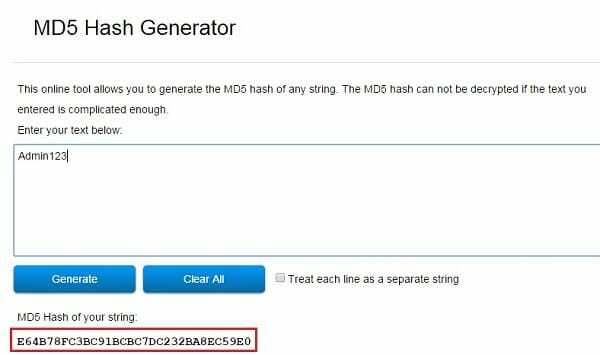 The password is stored as encrypted MD5 value. 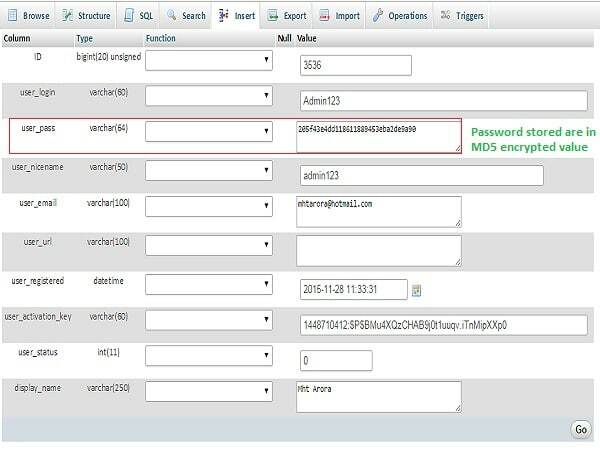 Step 10: Select “MD5” for the Function dropdown, and change its value to a new password, in our case the new password is “Admin123“. Step 11: Click on ‘GO’ once you are done. 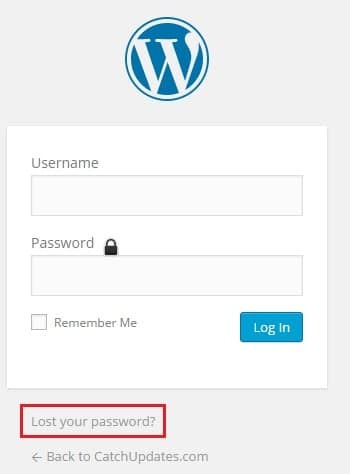 Step 12: Open the WordPress Login page again and enter the username along with the new password in the WordPress login area. You should be able to login to your dashboard now. Step 13: You have successfully reset WordPress password. Step 1: Login to your FTP server and navigate to your WordPress installation directory. Step 2: Go to “wp_content/themes/” and enter the theme folder which is currently activated on your website. Step 6: Go to the WordPress login page. Step 7: Enter your superuser username (in most cases it “admin” or “Admin”) and fill the password field with the password, “Admin123” (without quotes). Step 9: You will successfully log in. Step 10: Do not try to log in again for now. Each time you try to log in, you will reset the WordPress administrator account password. This is because the wp_set_password() function is still being executed. Therefore, we need to remove this function. Step 11: To do this, again edit the functions.php file and remove the line you have added before and save the changes. Step 12: Change the password from the WordPress dashboard that you want to keep. Step 13: Next time you can log in with your new password that you set in the previous step. Congrats!!!! You have successfully reset WordPress password. Is there any other way that I could mention to recover lost WordPress password? Do share your comments below.